The site of Zona Arqueológica Cerro Dos Cabezas is located in the Jequetepeque Valley of Peru’s North Coast and consists of approximately one square kilometre of archaeological remains, including a 105-foot terraced pyramid. The site was occupied from around AD 150 to 550 by the Moche culture. It is believed that certain sectors of the site had already been looted by the 1970s, although that material from the looting did not hit the art market until the 1980s (ICE 2010). In the immediate aftermath of the looting of the spectacular Moche tombs at Sipán, it is likely that Dos Cabezas was looted again. In 1994 an archaeological team lead by Christopher Donnan of UCLA began rescue excavations at Dos Cabezas. Their primary goal was to explore and preserve tombs which had already been looted (Maugh 2001). Donnan went on to find several unlooted Moche tombs containing gold and silver objects. Donnan has stated that “the only [Moche] tombs that are richer are those that were excavated at Sipán” (Donnan quoted in Maugh 2001). Looting remains a perennial problem at Dos Cabezas. The core of the site is large and difficult to monitor effectively. Even daytime looting could easily go unnoticed and some reports indicate that looting incidents have occurred there while archaeologists were working within the archaeological zone (Diario Últimas Noticias Pacasmayo 2011a). Around November of 2009 Dos Cabezas was hit by a new spree of looting incidents. Archaeologists from Peru’s Departamento de Monumentos Arqueológicos determined that a previously unknown tomb was completely sacked and a large portion of the pyramid was damaged by the digging (Diario Últimas Noticias Pacasmayo 2009). Sometime during the week of 5 February of 2011, Dos Cabezas was looted once again. The south-eastern side of the main pyramid at the site was damaged by around 20 different looters’ pits and an analysis of the spoil indicated that the looters had encountered another elite tomb (Diario Últimas Noticias Pacasmayo 2011a). The looters were rumoured to be locals who were employed by known antiquities traffickers (Diario Últimas Noticias Pacasmayo 2011a). The deputy mayor of the municipality, Fernando Isla Merino, criticised the looting and indicated that local government’s hands were tied: they were unable to protect the monument and were seeking to coordinate efforts with governmental authorities (Diario Últimas Noticias Pacasmayo 2011a). Experts from the Dirección Regional de Cultura located twenty three recent looters’ holes at the site in late March 2011 (Diario Últimas Noticias Pacasmayo 2011b). In August 2011 archaeologist Steve Bourget donated funds for the salaries of two round-the-clock guards to monitor site in an effort to prevent further looting (Diario Últimas Noticias Pacasmayo 2011c). Objects thought to be from the site of Dos Cabezas appear in museum and private collections around the world and have been the subject of high profile trafficking seizures. On 5 August 2009, U.S. Immigration and Customs Enforcement seized two Moche ceramic vessels that had landed at JFK Airport, New York, aboard a Swiss Air flight. 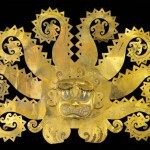 The pieces are thought to have come from either Dos Cabezas or the nearby site of La Mina. They were accompanied by forged invoices that indicated the vessels had been purchased in the 1960s in Germany (ICE 2010). The importer, German collector Anton Roeckl, was alleged to have fabricated the invoices. Roeckl returned the pieces to Peru on 2 November 2010 as part of a settlement to avoid charges (ICE 2010). Diario Últimas Noticias Pacasmayo (2009), ‘Habrían saqueado una tumba en huaca Dos Cabezas’, Diario Últimas Noticias Pacasmayo, 23 November. — (2011a), ‘Otro atentado contra patrimonio arqueológico de Dos Cabezas’, Diario Últimas Noticias Pacasmayo, 5 February. 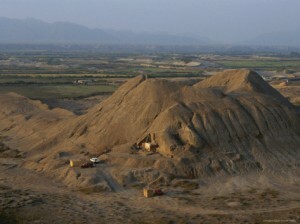 — (2011b), ‘Siguen saqueando Cerro Dos Cabezas’, Diario Últimas Noticias Pacasmayo, 1 April. — (2011c), ‘Guardianía en Cerro Dos Cabezas’, Diario Últimas Noticias Pacasmayo, 25 August. 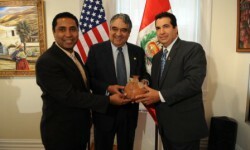 ICE (2010), ‘Art collector settlement allows repatriation of 2 rare ceramic antiquities to Peru’, Website of the ICE <http://www.ice.gov/news/releases/1011/101103newyork.htm>, accessed 1 May. Maugh, Thomas H. (2001), ‘Pyramid in Peru Yields Unprecedented Buried Treasure’, Los Angeles Times, 15 February.